There will be moments in any good story where the main character is under duress. Where something is… wrong. How does a filmmaker convey this? With a dutch angle. A Dutch angle is a classic cinematic technique to create unease inside the mind of the viewer. In this post, we’ll break down Dutch angles so that you can use them in your next project. How do you enhance an unsettling moment in your script through cinematic techniques and visual language? One great way to do this is with a Dutch Angle. So what exactly is a Dutch angle? What is a dutch angle? A dutch angle (known as a dutch tilt) is a shot that has a noticeable tilt on the camera’s “x-axis.” It’s a camera technique that was used by the German Expressionists in the early 1900s. Directors often use a Dutch angle to signal to the viewer that something is wrong, disorienting, or unsettling. What Dutch angle shot considerations are there? As we explore the Dutch angle in detail, keep in mind that the Dutch angle shot does not live in a vacuum. Yes, Dutch angle shots look awesome and feel stirring. But it’s critical to introduce your Dutch angle in the right place, at the right time. 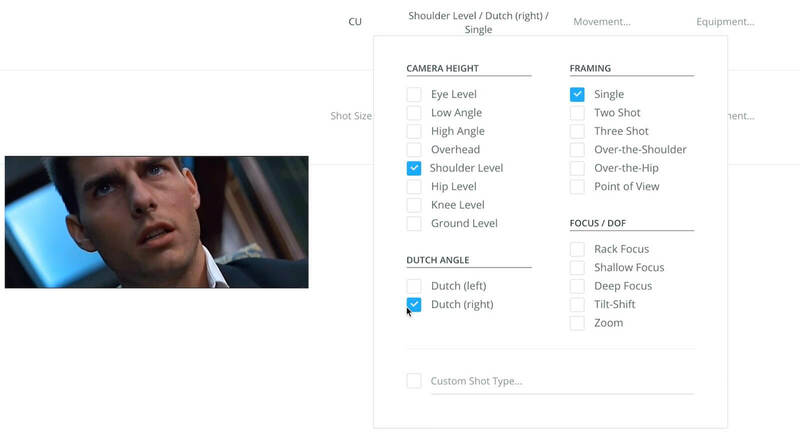 Consider the Dutch tilt within the context of your entire shot list. Every shot matters based on the relationship with the other shots in the scene. The Dutch angle can skew the audience’s perspective, so they’re in the same mindset as the characters they’re watching on the screen. Again, wrong doesn’t mean immoral or bad, it just means different from the orthodox way perceiving information. You’re not judging the behavior, just exposing the abnormality. The Dutch angle shot used to be called “The German Angle” because this camera angle came to prominence in early 1900’s German Expressionism. The Cabinet of Dr. Caligari utilizes the Dutch tilt for its dystopian world. As film evolved, the Dutch angle became part of mainstream Hollywood. Let’s go over some Dutch tilt film uses. Are you making a movie with a non-traditional villain and want to let the audience know how skewed their vision of the world is? Quentin Tarantino uses dutch angles all the time, even when his protagonists have the upper hand, like in this shot from Inglorious Basterds. Dutch angle in Inglorious Basterds. But what if your scene actually involves a warped world? Inception uses the Dutch angle much more literally than many earlier uses, and in many cases your POV shots will have a natural Dutch angle applied to give us the sense that we’re using the character's eyes. 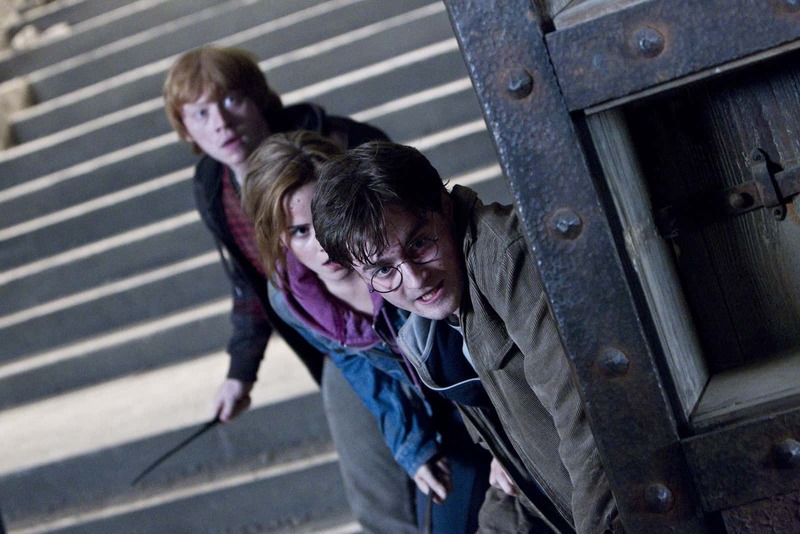 You can use your dutch angles in exciting scenes, like the one above from Harry Potter, to help raise the stakes of the action in progress. When your entire film is about something like racism, maybe the dutch angle can be used as a motif throughout your story. When you read through a good script, you will find a moment where everything changes. Where something big happens. These are the moments where your film literacy and knowledge of filmmaking techniques will come in handy. De Palma finds the moment in Mission Impossible at the climax of Act I. In this scene, Ethan Hunt arrives at a restaurant in Prague. His entire team has just been murdered, and he now has to meet with his boss, Kittridge. Kittridge thinks Ethan murdered his own team on behalf of an arms dealer. Ethan doesn’t know this yet, and neither does the viewer. Kittridge has also brought a second team of IMF agents to the meeting, which he has failed to mention to Ethan. This moment marks a big shift in both the scene and in the film, and De Palma knows to signal this to the viewer. He did the work, analyzed his script and story, and found a moment to effectively use a Dutch angle. Do you have a big plot shift or revelation like Ethan’s in your project? If so, you’ll want to call it out. When you create a script breakdown. While we’re talking about the script, the second IMF team is casually mentioned as “a dozen restaurant patrons.” Their identities are only brought to our attention once Ethan points them out. This may be just a short sentence, but how we decide to reveal them will impact our shot list. We need to label “Dozen Restaurant patrons,” and add a note to remind you of their importance later. It’s also required that these be the same actors from previous scenes, just in different wardrobe and pretending to be different people. So take note of that as well. De Palma doesn’t just find the moment in the script to use a Dutch angle, but rather he finds the precise moment within the scene. Then, he uses his shot lists and storyboards to indicate when he’d like to deploy this cinematic technique. 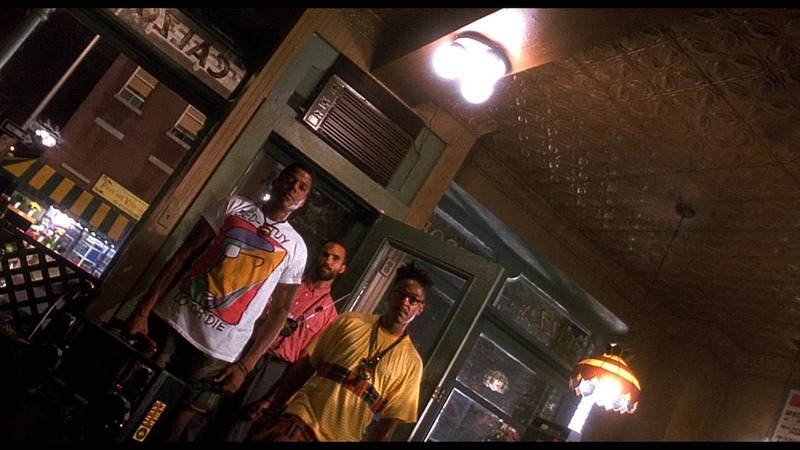 The reason Dutch angles work so well in this scene is that they’re preceded by shots with standard composition. Switching from normal to extreme framing creates an even larger shift within the scene, and we see this transition play out in real time. Otherwise, you end up with Dutch angle overdose, and it starts to lose its impact. De Palma creates a feeling of ownership, pride, and sophistication within the viewer because he lets them assemble the puzzle on their own. Now, let's dive deeper into how this scene was exactly shot listed. An MCU on Ethan. This shot is slightly below Eye level and a Single. When we use the term “Single” we mean that the shot is not framed OTS (​over the shoulder shot) of another character in the scene. De Palma’s use of an MCU Single works perfectly for this moment, because Ethan is isolated, alone, and disconnected. If Kittridge had his shoulder in the frame, the visuals would suggest a sense of connection between these characters. Kittridge is also framed in an MCU. Additionally, De Palma places a member of the second IMF team in the frame - keep that in mind for later. This shot composition suggests these characters feel differently from one another, but it does not suggest any danger or disorientation. In short, we don’t feel as though anything is wrong. We finally get to see these characters connect for the first time. De Palma shows us this brief moment by switching to a wide two-shot. The transition to the wide two-shot is motivated, because it allows us to see Kittridge pass the documents to Ethan, but we also gain this slightly disarming moment as suggested by De Palma’s choice of framing. Kittridge leans forward, and he stays forward, which adds an imposing contrast to Ethan’s slumped, de-powered form. Would this scene have been as effective without this shot? Take note that yet another IMF agent is in the frame. When Kittridge lies to him, there is a power shift. Ethan’s view of the meeting has changed. Tilted on its side. So De Palma changes the visuals. We’ve identified the moment. Considered it. Now it’s time to enhance the scene. 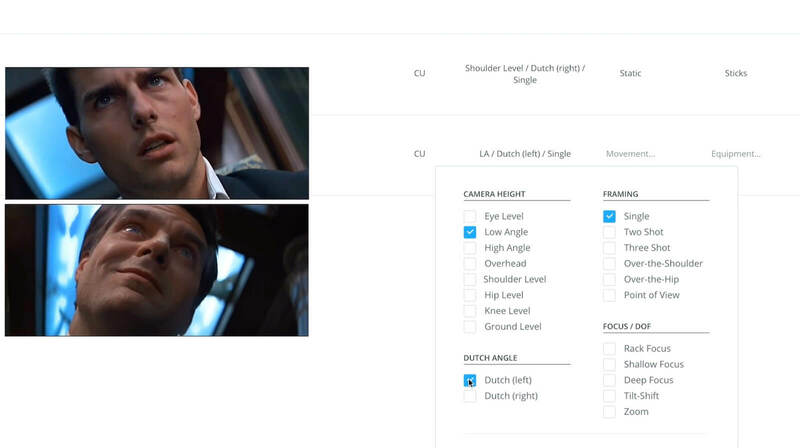 Before going on, check out the Mission Impossible Dutch angle in a sample shot list below. When you view the shot list, make sure to click between the Layout options on the top-right to view it as a storyboard, or slideshow. For this particular Dutch tilt example, we find that the Image List and Storyboard shot list layouts best visualize the scene. Also, take note of the 180 degree line break when it cuts to Kittridge. Dutch angle is a broad term. You can add layers to these shots that will say different things to the viewer, all while keeping the common visual theme that something is amiss. A 20-degree tilt will make the viewer feel differently than a 45-degree tilt. The more unsettling your shot becomes. Consider this when preparing your own Dutch angle, and how the imagery in your shot aligns. The Dutch angles De Palma uses in this scene have a very shallow depth of field, most likely achieved by placing the camera rather close to the actors. The shallow depth of field makes an already unsettling shot become claustrophobic. It ratchets up the tension. De Palma uses different camera levels for each Dutch angle in this scene. The shot on Ethan is disorienting and claustrophobic. De Palma wants us to connect with Ethan's discomfort. In a situation like this, you need to make sure your Dutch angle signals danger, but doesn’t go so far as to present Ethan in a negative light. He is, after all, the hero of the story. Do what De Palma does in this scene. Keep the camera close to shoulder level. Make the viewer scared for Ethan. The shot on Kittridge is also disorienting and claustrophobic, but it goes a step further and presents Kittridge as hostile. Let’s see how. The ​low angle shot empowers him, and the dutch angle adds a sinister twist. We are scared of... Kittridge. We are scared for... Ethan. Ethan sees Kittridge as a threat. This scene was shot in two different locations. The other half at Pinewood Studios. Identify the Moments during your script breakdown. Consider the Moments during your shot list & storyboard. Enhance the Moments with advanced film grammar. Now that you know everything you need about Dutch angles, why not plan out a few of your own by making a detailed shot list.